Egypt said Tuesday it had brokered an understanding to halt Israeli-Palestinian violence and move toward a peace accord, hours after Hamas militants set off a bomb in Gaza that killed an Israeli soldier and triggered Israeli retaliation that left four Palestinian militants dead in the most serious violence since the death of Yasser Arafat. Egypt's state-run news agency, MENA, reported that Cairo would call for a July peace conference in Washington to include all parties to the agreement: Israel, the Palestinians, the United States and the European Union. The plan calls for an early cease-fire and contains overall principles for ending the Israeli-Palestinian conflict, MENA reported, adding that a dialogue among Palestinian factions on a cease-fire agreement would begin in March in Cairo. The agency said the Egyptian plan, which was discussed with Israeli Prime Minister Ariel Sharon and other officials, included the withdrawal of all Israeli forces from Gaza and a plan for Egyptian border troops to be responsible for security of the Egyptian-Palestinian border and the Palestinian side of the border with Israel. Responding to the report, Israeli officials said there was no new agreement for a cease-fire. The officials, speaking on condition of anonymity, said that the test of a cease-fire would be in its implementation, not its declaration. "If the Palestinians come up with a truce, that is to say they cease and desist from acts of terror, then we shall refrain from acting against them, except in the case of persons posing an immediate danger," one official said. Palestinian officials were not immediately available for comment. The MENA report said the agreement included steps the new Palestinian leadership would take to solidify its control of the West Bank and Gaza, as Palestinians move to elect a new leader on Jan. 9 to replace Arafat, who died Nov. 11. The Gaza part of the deal appeared to fit Israeli Prime Minister Ariel Sharon's plan to pull Israeli soldiers and settlers out of Gaza next year. Sharon called the plan "unilateral disengagement," but lately he has been talking of coordinating it with Egypt and the Palestinians. Last year, Israel and the Palestinians accepted the internationally backed "road map" peace plan, which begins with a halt to violence and an end to Israeli settlement building in the West Bank and Gaza Strip, leading to a Palestinian state. The plan was stillborn when neither side carried out its initial obligations, each blaming the other. The MENA report did not indicate whether the new agreement is different from the "road map." In London, the Telegraph newspaper reported earlier this week that Britain would be host to an international peace conference on the Mideast early next year and that Washington had agreed to the gathering. The newspaper, without naming sources, said the meeting in London was designed to shore up a new Palestinian leadership after the January vote. Just as Egypt was talking of a new truce, however, Hamas militants broke three weeks of relative calm in Gaza, setting off a bomb that killed a soldier and triggered Israeli retaliation that killed four Palestinian gunmen. Hamas claimed its men dug a tunnel to booby-trap a chicken coop, then lured troops to the area with the help of a double agent and exploded the bomb, killing an Israeli handler and his bomb-sniffing dog. Israel TV reported that the dog set off the bomb, killing the soldier and two Palestinians guarding the entrance to the tunnel. Mushir al-Masri, a Hamas spokesman, said the attack was a "natural response to the continuous Israeli crimes against our people and against our fighters." Hamas said two members involved in the ambush were killed. Interim Palestinian leader Mahmoud Abbas has been urging militant groups to stop attacks against Israelis to allow for a calm presidential election campaign. At the same time, Palestinian leaders have complained of Israeli raids in the past week targeting Hamas and other militants in the West Bank, warning that the raids could endanger efforts to get the peace process back on track. 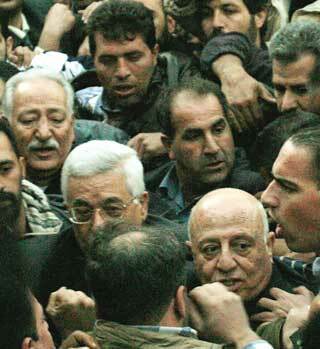 Polls show that Abbas, 69, the candidate of the establishment Fatah Party, is in a tight race with Marwan Barghouti, the West Bank Fatah leader serving five life terms in an Israeli prison for involvement in fatal Palestinian attacks. Barghouti, 45, is running as an independent. Tuesday's bombing was the first fatal Palestinian attack in Gaza since Arafat's death, though mortar and rocket attacks on Jewish settlements in Gaza and Israeli towns just outside continue daily. The bombing took place next to the vital Karni crossing point between Israel and Gaza, the only place where food and produce can enter or exit the crowded seaside territory. Soldiers closed the gates after the bombing, and the military would not say when the crossing will be reopened.